Savenaca (Save) is an 11 year old boy. Save's father was badly injured in a work accident in 2009. He became wheel chair bound but later died. In Fiji there is little support available for victim's families. Save's mother moved away taking the older 2 children with her and leaving Save with his Uncle and 3 cousins. They live in very humble conditions without electricity. Save's uncle earns a living through subsistence farming. 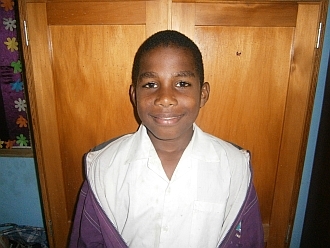 Save enjoys attending school and his favourite subject is English. Save travels to school each day by carrier. When he grows up, Save wants to be a professional rugby player and represent Fiji. Save's father passed away and his mother moved away with the twins. He relies on his Uncle for a place to stay in the village. I recommend him for educational support.